Early Rosemalers were always updating their styles to what was popular at the time. Today, we can look back and clearly see the evolution of the designs. For example, Ole Halstensen Sjoli updated the Osterdalen style through the Rococo, Louis XVI and Empire periods. He created many variations of Osterdalen. After his death in 1827, the style all but disappeared. Fresh ideas and creativity are necessary to keep painting styles alive. Designs and styles move from one extreme to the other. For example, the fluid, fanciful style of the Rococo and Louis XVI era was followed by the strict lines of the Empire and Regency. Styles reversed again during the Impressionist movement of the later 19th century. So what was popular in one era, the opposite style is bound to become popular again in another design period. Change! When I started to paint in the 1970s, the styles were painted freehand, without a pattern. By the time bottle acrylics arrived in the 1980s, the styles had become precise, mechanical, and symmetrical. Perfect side loads and detailed line work were considered the mark of a professional, especially in the American Rogaland style made popular by my friend and mentor Gary Albrecht. I studied and perfected my mechanics, concentrating on stroke blending and perfect lines. Then trend changed in the early 2000s and the decorative painting market started to collapse. People change and art needs to change too. With this in mind, I have begun to relax the lines in Rosemaling. I created “casual” styles of painting. I switched from stiff synthetic brushes to the softer fusion brushes. These synthetic squirrel hair brushes do not allow precise strokes. Squirrel and cow hair brushes are the earliest brushes used in Rosemaling. I returned to painting freehand and limited my palette colors. The majority of my students embraced this new method. It takes practice and courage to paint freehand, but it is the key to making the style grow and change. Today, for me, the structure of the 90s has given way to more casual interpretations. Not everyone will agree, but not everyone likes orange either! So, we now have a special section of Rosemaling in our store. 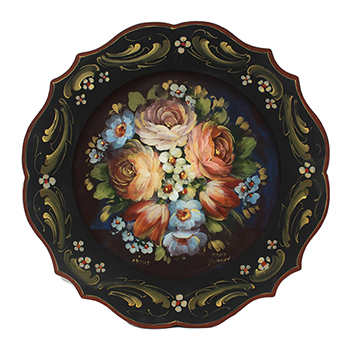 This is dedicated to updating new looks for Rosemaling. More than anything, it represents change and evolution of this magical style which is such a large part of our family history. I hope you will join us on this historically based, contemporary look at these styles.